In the past I might have turned down such an offer, and in fact, I remember in AC:WW I wanted to grow my first blue rose myself, so I turned down a gift of one someone offered me… and it made them sad, which made me sad. 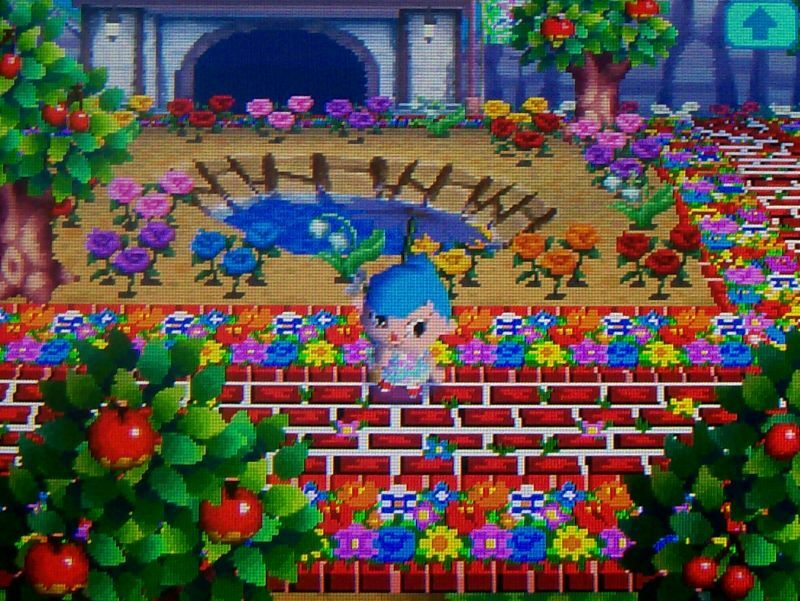 😦 In the end, I never ended up being able to grow my own blue rose in that game (I guess it was statistically almost impossible, what with all the other flowers in Dafdilly), but I had three blue roses that were gifts from friends, and I really treasured those blue roses and loved using them to decorate parts of town. So after that experience, I guess I’m taking a different approach this time around, by valuing my own enjoyment/happiness of the game (more hybrids=more fun) over pride in growing all hybrids “legit” from scratch. 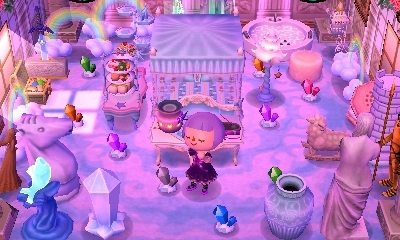 Plus, some aspects of hybrid growing confuse me in New Leaf, like the hybrid-red-flowers business, and also, I have so many lilies and violets in town that it’s difficult to grow other types of flowers. If I knew she was going to give me so much, I would’ve prepared more, but I gave her a pair of blue roses. She wore Citàlune’s town flag as a shirt, hehe, cute! I gave her a tour around town and through the houses, and we chatted. 🙂 Thanks for coming Megan, and for all your gifts! Jessica from Sandy stopped by as well. I was a bit embarrassed to have people over when my town was so messy and under construction, but I thought I’d show them the progress of my new path (I’ve made more progress since this pic, but it’s still not done — it’s pretty complicated with lots of corner/intersection pieces). On November 12th I WiFied with Marina of A Box of Stale Cupcakes for the first time! I don’t know why, but I like this picture of us gazing into Main Street! xD She let me browse her Emporium and I bought a pack of fertilizer and a harvest wall, thanks for that as well! This park by the waterfall is lovely! I think your wish has already been fulfilled, Marina! ^_^ Thanks again for the gifts and for having me over to explore your town! 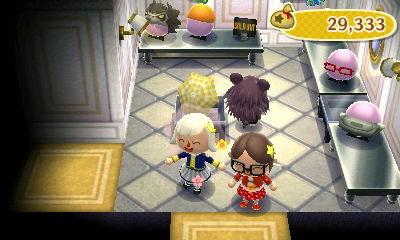 A few days later I got to WiFi with another blogger from A Box of Stale Cupcakes, Katie in her town of Bearvile! Beauutiful rainbow roses! And these paths are amazing, I’ve seen them around elsewhere and they catch my eye every time! Since I don’t have the cafe in my town (starting to wonder if I ever will xP), I always try to take the opportunity to get a cup of coffee in other towns. And I like the wallpaper/carpet combination and overall feel of this room, like an elegant library/study. And after all that, I got a new badge! xD Aw, it’s cute thinking of the towns of people on your friends list as your neighborhood! 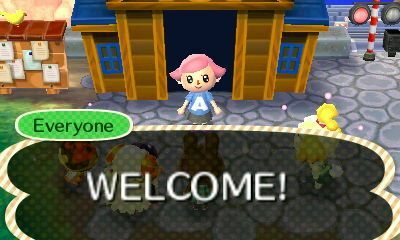 Posted on November 22, 2013 by Amy •	This entry was posted in AC:NL, AC:NL WiFi and tagged Animal Crossing. Bookmark the permalink. 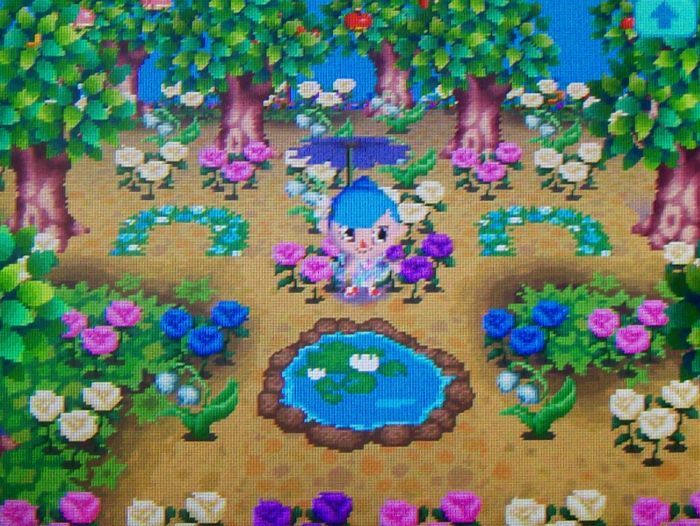 Looks like you’ve visited some nice towns 🙂 I’m trying to grow blue roses too! I have four red hybrid roses, but for some reason they wont hybrid in blue roses.. Anyway, well done on your badge! I sure did! 🙂 I never managed to get a blue rose even though I watered quite a large patch of hybrid reds (like 30+ of them) for a pretty long time. (The blue roses I have were grown from a breeding pair Ryann gave me.) I’ve heard the chance is around 5%, so it could take a while, but good luck! Your path looks great so far! Haha, I actually kind of like it with the unfinished semicircles 😛 I’m looking forward to being able to see it when it’s completely finished! Thanks again for visiting my town, and I hope we can WiFi again sometime! The path north of the tree is actually seen in this picture; it might could’ve worked except for the rock. 😛 Ah well, don’t know if I can have a heavily tree-lined vertical path in Citalune. Yeah, to be honest, I can’t say I like any of the rocks in Citalune, I would prefer it if they all didn’t exist 😆 But compared to the one in front of the town hall, which gives me raaage, the other ones in town don’t really bother me too much. My town is on the 24th now. 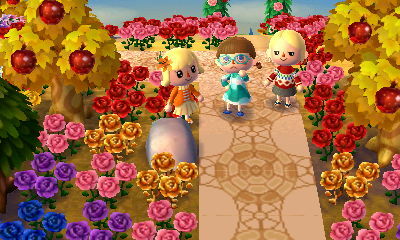 So once I finish the patterns and landscaping goals I want to do, it won't be too hard to progress to the 31st. I don't have a set date in mind (it depends on when I finish the patterns and such), but I'll post when I'm ready to host the second-chance-Halloween! 🙂 And then I'll try to really speed through as fast as I can manage to the present time. Haha, I prefer making clothes to making paths 😛 Like I said, I’m looking forward to being able to see your finished paths! I definitely don’t think you should rush them just to catch up with the real date – take your time and they should look perfect! Haha, the same happened to me once with a gem rock! It can actually be a pretty common occurrence, enough for me to always have a shovel on the ground now (hidden behind the town hall). I think the patch of dirt grew back surprisingly quickly, though, so hopefully yours can fill in with grass soon too! We’re opposites in that regard, I don’t like making clothes at all. 😛 I guess I’m not an AC fashionista, I’m fine with just wearing the in-game clothes and wouldn’t want to use up my pattern slots on dresses instead of ground patterns. Yeah, I can keep my town on Halloween for a little while if necessary, and hopefully it’ll end up being a weekend or something like that! I’ve heard that purple pansies are grown from hybrid red pansies (which are grown from a hybrid pansy+a red pansy) [source]. So they’re hard to grow for that reason, like blue roses. At the latest, we can always do these exchanges when I catch up to Halloween in my town and I have you over to collect the rest of the Halloween exclusives you need (if you still want to do that :)). I’m still not done with my patterns and caught up to Halloween yet, but I hope to be within the next week or two. Hehe, I did know that — I ate my first super mushroom, which I was pretty annoyed with myself about since it took me forever to grow another one 😆 I wish the effect lasted a bit longer, it would be fun to run around town all giant like that! 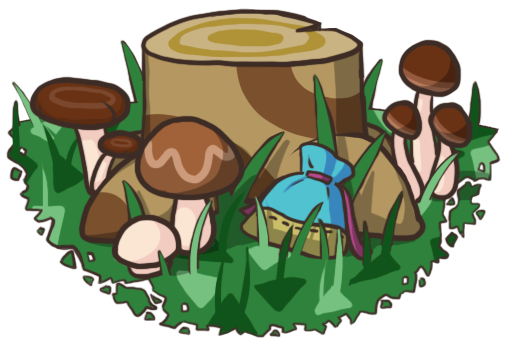 I actually started to leave some mushrooms around town (well, mostly just in my “forest” area around the town tree) for decoration. Okay, thanks so much! Argh, I guess that explains why I’m not getting any then – I hate the red-hybrid rule in this game! They could’ve at least had the hybrid-red flowers have a different colour root or something so you could tell them apart, then I wouldn’t have a problem with it! Also, I have a trash spot in the corner of my town that has valuable items that ‘I felt bad if I sold them’ type thing, so you can help yourself to that! Currently it has 6 orange lilies, 10 pink lilies, a black cosmo and a black rose (if I remember correctly haha). Sorry if I double commented, my internet disconnected so I’m not sure if my last comment went through. Don’t worry about it! It was kinda fun! Actually I have a confession to make… I also went offline without saying goodbye, I had to take the screenshot from my SD card and edit it in Photoshop. 😆 I’m glad you like it, anyway. If you ever want anything else just ask. It’s nice to feel like part of the blogging community again – even if it is just a tiny, tiny role.